California winters may be mild compared to what other parts of the country experience, but the weather can nonetheless take a toll on local residences. When a home isn’t properly winterized, the heavy storms and occasional freezes can cause everything from dry rot and roof leaks to cracked water pipes and crawl space flooding. That’s why, even in California, it’s crucial to perform preventative winterization measures on your home and property in the fall. To help you cover all the pertinent bases, we’ve compiled a comprehensive two-part guide to exterior and interior home maintenance. In this article, we’ll go over the first aspect: exterior maintenance. By reading both articles, you’ll learn just about everything you need to know to prepare your California home for winter. Inspect and maintain nearby trees. Exterior home maintenance is best approached like most maintenance tasks—by starting at the top and working downward. In this case, start by inspecting and trimming any large trees near your home. During stormy weather, tree branches and leaves can cause all sorts of problems, including roof damage and clogged gutters. First, assess the trees and make sure they look healthy (if you don’t know what to look for, consult a certified arborist). Next, check the proximity between tree limbs and your roof. To keep rodents and insects from accessing your rooftop, all limbs should be trimmed three to six feet from the roofline. If your trees appear unkempt or overgrown, it might be time to have them professionally serviced. Besides improving the look of your landscape, well-maintained trees help minimize safety concerns like falling branches. Clean and inspect your roof. Before the winter rains set in, it’s important to clean your roof and verify its condition. Start by clearing leaves, tree branches and other debris off of your roof, paying special attention to valleys and other areas where debris can collect and cause leaks. 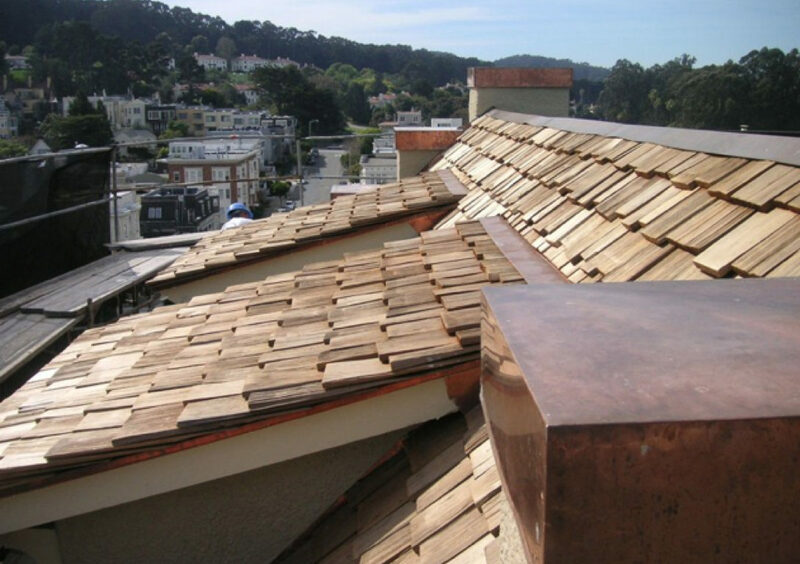 Next, inspect your roof’s shingles and waterproofing components, including seals and flashings around penetrations like pipes, vents, skylights and chimneys. Since the summer heat can cause rubber seals and caulking to wear out prematurely, it’s wise to check these elements before winter and replace any that are worn out. While some homeowners do their own roof maintenance, due to the risks involved, we recommend leaving this to a professional. If you’re set on doing it yourself, make sure you’re using the right kind of ladder and know how to use it safely. Learn more about ladder safety. Besides removing leaves and debris from your roof, be sure to clear out your gutters and downspouts. An excess of debris can cause gutters to clog and overflow during heavy rains, which can result in costly damage to your roof, siding and windows. Seal exterior gaps and cracks. Most homes (especially older ones) contain gaps and cracks between exterior elements like siding panels and door/window trim. While usually small, such fissures can nonetheless leave a home vulnerable to air transmission, water intrusion and pest infestation. To prevent these, go around your home and seal up all visible gaps and cracks with caulking. For the best results, use a paintable latex caulking rated for exterior use. To seal any gaps wider than a quarter-inch, use a plastic foam filler. Don’t forget to address unsealed gaps around your eaves (the parts of your roof that hang out over the walls). While often overlooked, unsealed eaves can provide easy access for pests, so check these and seal them as needed. House paint isn’t just for looks—it also seals the wood siding against moisture intrusion. Go around your home and assess the condition of the paint. Touch up any areas that look deteriorated; if the paint is in poor overall condition, schedule a professional repainting job before winter. Most residential windows slide on a track, outside of which are small “weep holes” that allow rainwater to drain out. If these weep holes are plugged up with dirt, the track is susceptible to filling with water during heavy rains. 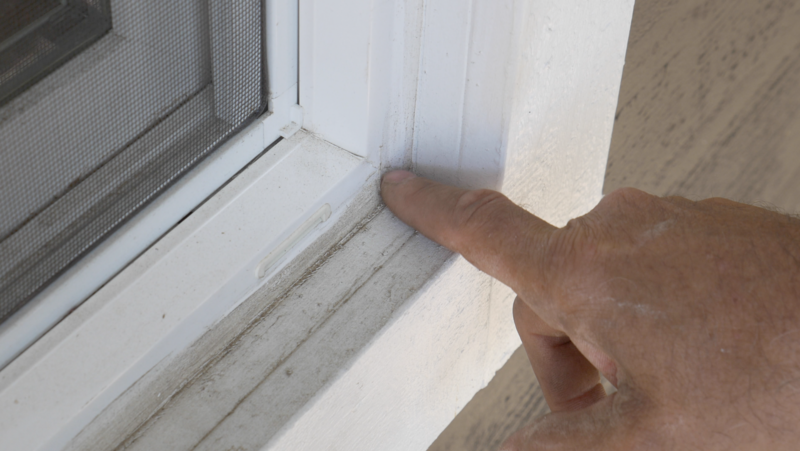 To prevent water damage, thoroughly clean all window tracks before the rainy season. Due to the reduced daylight hours, exterior lighting is a vital safety feature during winter. Test your porch light, security lights, path lighting and any other outdoor lighting elements. If you haven’t replaced the bulbs in a while, consider doing so proactively. For more safety tips regarding nighttime visibility in winter, read our related blog post. 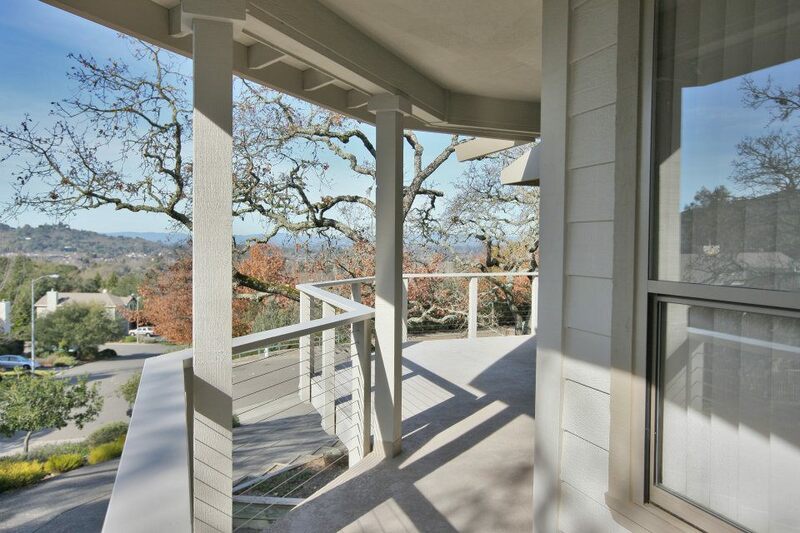 If you have a wood deck, make sure its paint or stain is in good condition. 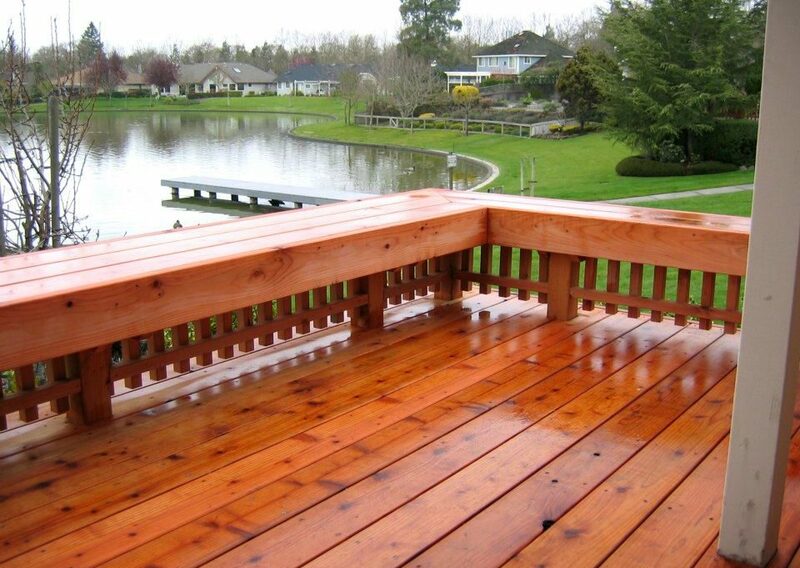 If needed, repaint/restain your deck before winter to protect it from the effects of rainy weather. Of course, you should also cover or put away any outdoor furniture and cooking devices for the winter. Standing water can cause a lot of problems, from foundation erosion to crawl space flooding and puddling on your property. To prevent these kinds of issues, you’ll need to make sure your home and property have adequate drainage. One simple measure is to ensure all gutter downspouts drain away from your home. Ideally, downspouts should terminate at least five feet away from the foundation. As for your overall property, there are two types of standing water you should know about: surface water and groundwater. Both can cause problems, so you’ll need to detect any instances and resolve them. Most surface water issues can be amended with a strategically placed surface drain, while groundwater issues are usually addressed using a French drain. Have a drainage professional identify the sources of your property’s drainage issues and prescribe solutions. To prevent water waste, change the settings on your irrigation timer before winter. It’s not always wise to turn off the water completely—after all, it’s uncertain how much rainfall will actually occur. A good solution is to add rain sensors to your irrigation system, which prompt the timer to delay following rain. Keep in mind that freezing temperatures, while not the norm, are nonetheless a concern in Northern California. To avoid damage to irrigation pipes, stay informed of weather forecasts and take preventative measures when a freeze is expected. Turn off the main water valve to your irrigation system and empty all connected hoses. Prune shrubs and garden plants that are entering winter dormancy. You should also identify and remove any signs of disease. Next, clear plant beds of debris and sow a cover crop of fava beans, field peas or similar leguminous plants. By minimizing erosion and providing nitrogen, this cover crop will sustain the soil for the coming spring. To learn more about putting your garden to bed for the winter, read our related blog post. As swim season comes to an end, it’s time to winterize your pool. Clean out leaves and debris, remove equipment (such as the floating chlorinator), and adjust your filter’s timer to run less often. 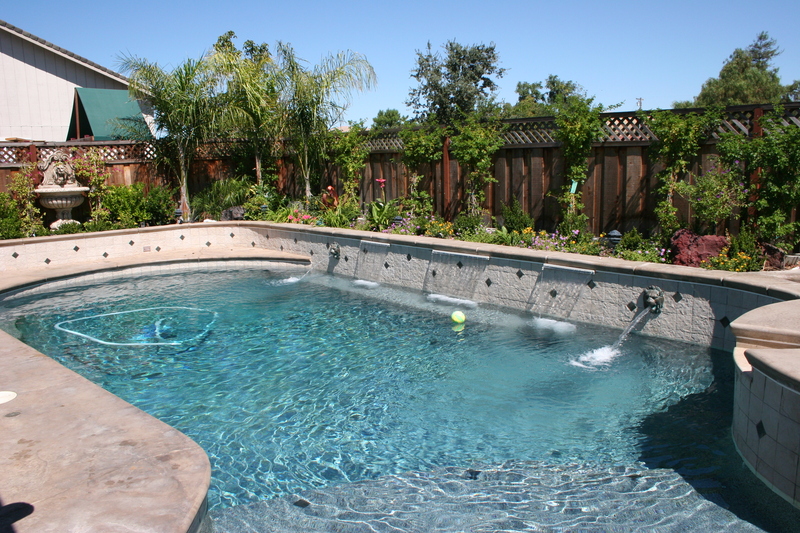 For more information on swimming pool winterization, read our related blog post. In addition to preparing the outside of your home for winter, you’ll need to prepare the inside. Read our follow-up article on preparing your home interior for winter. To find a Diamond Certified company that can help you prepare your California home for winter, visit www.diamondcertified.org.